I have completely neglected this blog about my chaparral garden for a very, very long time, but my garden is awesome and doing well. I’ve actually lost track how long it’s been since I swapped out the thirsty lawn and put it in. I’m thinking it’s been about 9 years ago and since then I’ve certainly learned a great deal about what plants to use and which ones didn’t work in my space. And I have made quite a few changes to it over the years, too. 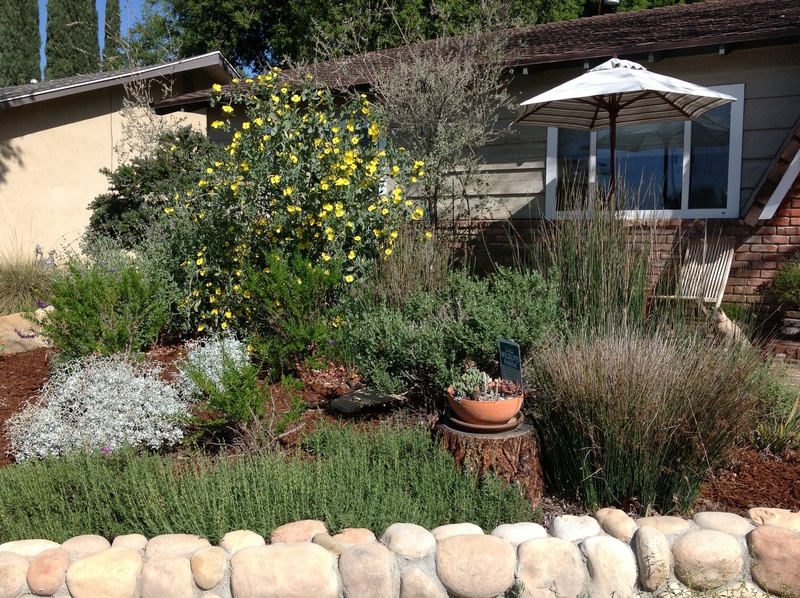 I removed a number of plants because initially there were too many of them, a common “rookie” mistake when you are setting out to create a drought tolerant and native plant garden. I know have a gorgeous Desert Museum Palo Verde next to the rocky, “dry” streambed and I can always count on lots of California poppies coming back each year and as a matter of fact, there are zillions of seedlings in it now. 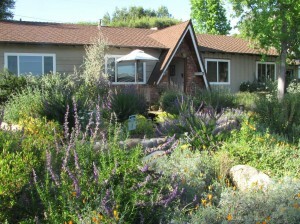 So, I was ahead of the curve for converting my lawn to a drought tolerant landscape and due to the on going drought here in S. CA, a lot of people made changes too but some were taken advantage of my unscrupulous people that merely removed their lawn and threw in some plants that eventually would die. However, there is still time to put in some “natives”. In S. CA check out the Theodore Payne Foundation in Sylmar for help and ideas. 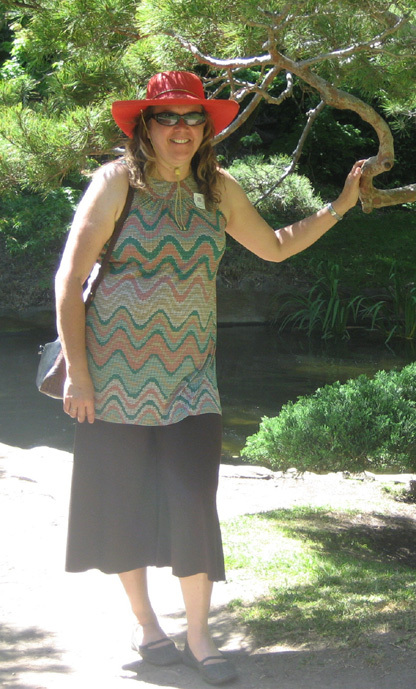 It has been a very long time since I have posted anything about my chaparral garden, due to the fact the my life has been very busy with my profession and frankly, there isn’t always much in the way of new things to share. 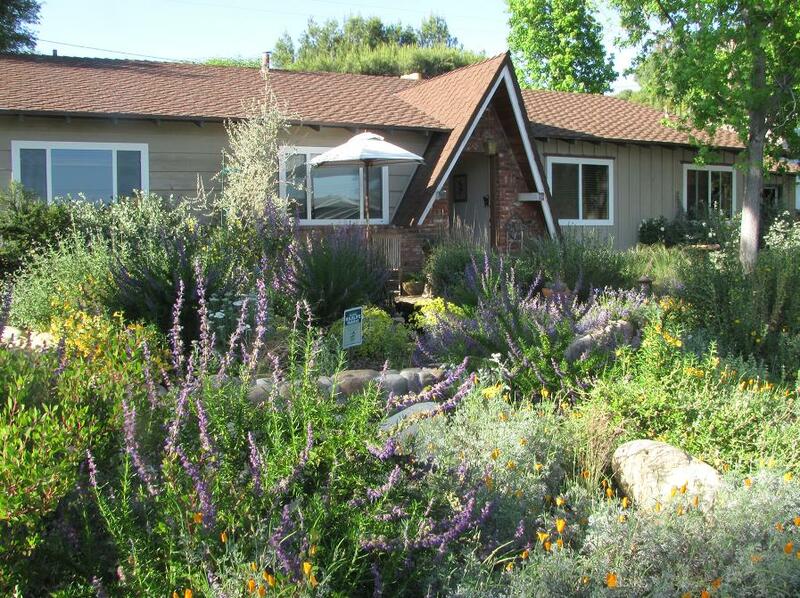 Given that, my garden has certainly changed and evolved over the last several years, since I removed my lawn and put in California native plants. I have eliminated some things that just didn’t work out or due to over planting, tried some new plants with a few failures but overall, the garden has done very well. We are now in the middle of the worst drought that California has experienced. We didn’t have any rain here in Southern California last winter and I had to do more supplemental watering because of the lack of rain. I am beginning to see some neighbors who have stopped watering their lawns but then there are those people who continue to water like they normally would and are ignoring the requests of the different water agencies to make efforts to conserve it. It’s very frustrating to see water running down the gutters, because some idiot doesn’t care about our problem and won’t make any effort to change their water habits. And I could really go on a serious” rant about how I feel about these self-absorbed people, but I won’t…. We are all hoping that this winter will bring a series of storms to the state, as all of our reservoirs are very low and now the more serious concern is the amount of ground water that is being removed at a rapid pace, too. Meanwhile, my own landscape is holding up quite well and yes, I do have to water during the summer, but only about once every three weeks. 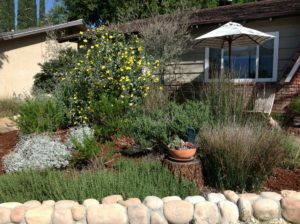 Most of the plants have been dormant through the summer and as things begin to cool off and hopefully we have some rain, it will spring to life and show how gorgeous a landscape with native plants can be.